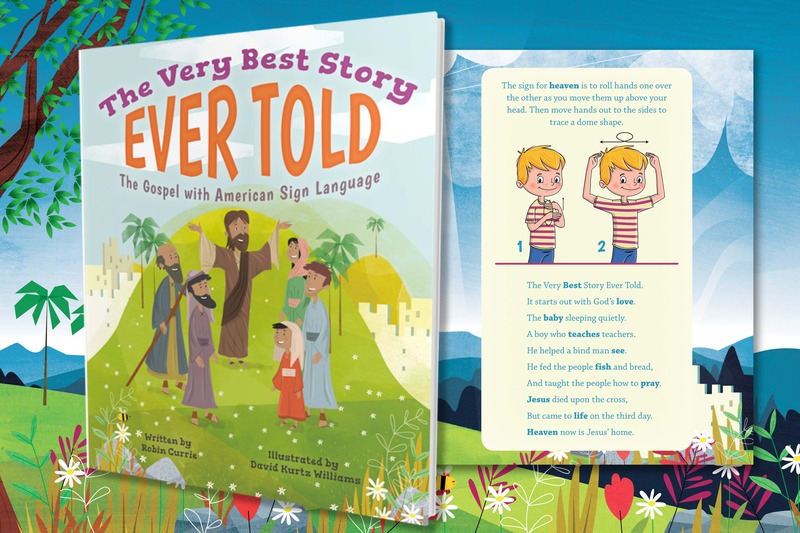 Today we are celebrating the release of The Very Best Story Ever Told: The Gospel with American Sign Language, so we sat down with author Robin Curie to chat about her new book. Q: What was your inspiration for the book? A: My two careers (public librarian for children and ELCA pastor) merged as I considered the best way to share the Gospel message with children: heart, mind and body. (Plus fun!) I have been incorporating body movements into songs and stories for years, ("If you're happy and you know it clap your hands - clap, clap"), but using actual ASL was new for this story. Signing has increased in popularity and accessibility for the hearing population. It is a highly useful second language. Q: What do you hope readers will learn or discover from reading The Very Best Story Ever Told? A: By using ASL (sign language) for each rhymed line, the simple and glorious truth of the Gospel is revealed and remembered. It becomes "muscle memory" for children in the same way nursery rhymes and action songs do. Q: What was the hardest part of writing this book? What was the most enjoyable part? A: Since this is essentially a story to be told, the best part was telling the story to various age groups over the years and seeing them master the Gospel in a way that reminds in their bodies as well as their minds. The hardest part was describing the ASL in words. The illustrator did an excellent job with the pictures so the entire story is easy to follow for readers. Q: What sets The Very Best Story Ever Told apart from other children’s books? A: It is not a "read to me" story but one to engage the child and parents in sharing the Gospel together. Like songs that have claps and stomps and gestures, we remember what we engage in fully. What better way to use this learning than with the gospel message? Q: What advice would you give to parents (or church ministry folks who may purchase this book) about how to engage kids in whole body learning? A: The more we move and interact physically with the stories and events around us, the more committed to memory they are. Remember the three little pigs? Even if you can't recall which one had a straw house, you remember "Huff and puff and blooow your house down!" because you acted it out. This book offers kids and parents a fun and engaging way to learn and tell the story of Jesus. To learn more about the book or to purchase, go here.